The Mughals form a people whose dynasty ruled over the north of India between the sixteenth and eighteenth centuries. The first emperor, Bâbur, had ascendants coming directly from the Mongols, and especially from the federation Genghis Khan (died 1227) and Timur, the great warlord of Central Asia (died in 1405). Their successors, in the fifteenth century, will produce artistic and architectural works that will become a norm in artistic creation in Persia. One distinguishes the "great Mughal emperors" from the "Mughal emperors". The first are the direct descendants of the founder of the dynasty over the first 6 generations, those who have stamped their imprints on the Mughal Empire. Under their reigns the Empire was strong, it had a constantly evolving but relatively important territorial control over what is, today, India. The other emperors were only a succession of sovereigns, often weak, who only lowered the Mughal power from father to son, until its end in 1857, when the British were the new masters of India. The flag of the Mughal empire is a rectangular green triangular banner with a lion in front of a sun, both motifs being gold. It is surrounded by red. The sixteenth century of the Islamist region, between the Mediterranean and South-West Asia, was ravaged by the succession of sultanates, kingdoms or empires from the twelfth to the eighteenth century. The smallest part of territories took the name of kingdom, as soon as integrated into an Empire, itself losing other territories, following revolts for example. There were only a few empires capable of maintaining peace over a wide territory, much as was the case in the Western Roman Empire in the days of antiquity. In this context it is necessary to be interested in the kingdom of Ferghana, currently in Uzbekistan. This kingdom was ruled by a man of Turkish-Mongolian origin married to a descendant of Genghis Khan. Their sons, Zahir ud-din Muhammad, succeeded his father, but was the victim of revolts which deprived him of his kingdom. He engaged in fighting against his enemies, but was forced to flee for three years. In the year 1526 he was able to gather enough warriors to engage in a battle against Kabul, and at the head of this kingdom he allied himself with the Afghans to mount an army of 12,000 men and attack Delhi in order to recover that city. 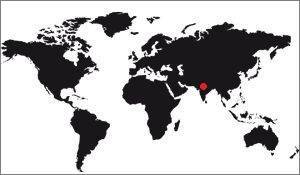 at the same time all the sultanate of Delhi. This conquest really took place in Pânipat, and it was this victory that marked the capture of Delhi and the founding of a new Empire, the Mughals. 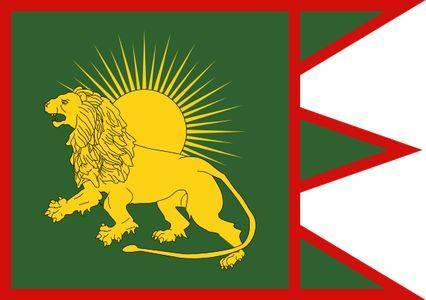 The Mughal Empire was thus created in 1526 in Pânipat. Pânipat is a city currently in the north of India, in the state of Haryana. It is, for its misfortune, a place of passage and marks a natural border between two regions, making it an ideal candidate to be the place of battle to enlarge a territory. This is what has happened to him several times since the twelfth century, but especially under Tamerlane, a warrior from the Mongol dynasty and Genghis Khan himself. Tamerlane was a cruel warrior who did not hesitate to massacre the population of a city as soon as it was conquered. He founded the Timurid Empire which reigned in the 15th century on territories now occupied by Syria, Iraq, Iran, Afghanistan. When this dynasty weakened its territory it morcella. Delhi was at the center of one of the pieces of the ancient Timur Empire, the sultanate of Delhi. 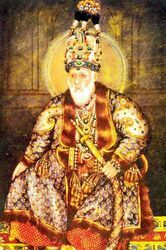 The Emperor of Delhi was, in 1526, Ibrahim Lodi, 3rd Sultan of Delhi. The battle of Panipat therefore engaged Zahir ud-din Muhammad and Lodi. This battle was the starting point of the Mughal empire. The birth of the Moghul empire comes directly from the victory of Zahir ud-din Muhammad over the Sultan of Delhi Lodi in 1526. The winner, once Delhi was taken, was called Bâbur, under this name - that we know him today. Basbur means "tiger". Born in 1483 he died after 4 years of reign, in 1530. Thanks to this victory he created a kingdom where he imported the Muslim religion, for he himself had Turkish ascendants. He pursued his conquest by quickly recovering Agra, and was then confronted with the army of Rana Sangha, of Chittorgarh, a city of Rajasthan. Despite being much weaker forces than his opponent, he won the battle and became master of Rajasthan. At the same time it must be known that Bâbur had a son, Humâyûn, who was sent to the new territory to enlarge it. The prince took the valley of the Ganges, which greatly increased the territory and allowed his father to fortify the new Empire. He chose Agra as his capital and centralized the administration in that city. Unfortunately he died in 1530, in Agra, leaving his son a growing but still fragile Empire. From a religious point of view, Bâbur regarded it as unimportant compared to what was practiced in other kingdoms. Bâbur tolerated that other religions were practiced on these lands and was in this a precursor to the broad vision. His descendants will follow this opening voice which was, moreover, one of the reasons for the success of this Empire compared to the others. It is interesting to note that it was precisely when one of the emperors applied a rigorist vision of Islam that the Empire began to fall. Local traditions were also respected, and although he reigned only four years, he introduced various influences into the Indian subcontinent. For example, in architecture, the Timurid tradition means that the land is divided by canals and basins of great symmetrical rigor, which will be found in all the constructions of the dynasty. Such gardens, which are called Charbagh, are generally in four parts, separated by four channels in a cross. They are a representation of Paradise on Earth, as the Muslim tradition wants. However, among the Moghols of the sixteenth century this spiritual dimension, if important, is also seen as a visual metaphor of the Mughals' ability to govern their territories, the perfect ordering of the gardens to prove to the conquered their ability to regulate the problems of the populations. According to this aspect, no one can pretend to direct if he does not know how to direct his own garden. The legacy of Bâbur is therefore twofold. On the one hand, there is a new Empire which only wants to expand, and on the other a new culture, derived from both Islamic and Hindu influences. The son of Bâbur, Humâyûn, recovers it and tries to make it fruitful. The son and successor of Bâbur, Humayun, received the reins of power while the Empire was not yet perfectly structured, so it had great difficulty to stabilize it. The strength of his reign is to have succeeded in this, bequeathing to his son a crushed Empire. Humayun was born in 1508. As a young man, he followed his father in his conquests, he had participated in the battle of Pânipat, and later in those of Kabul and Delhi. He ascended the throne in 1830. At the time of his accession he had to face the rebellion of two warlords, a revolt of the population and the hostility of the local nobility. Humâyûn had to mount an army and went to Kalinjar, a city he sat down, and of which he accepted a ransom to raise it. But other rebellions were triggered and he had to leave them, which took time because the time to move and defeat an army, another rebellion had unleashed in Bihar, in the East this time. Humayun was taken to court by the new Sultan of Bihar and had to flee to Punjab before exiling for Sindh in Afghanistan. He returned in 1554 thanks to the Persian sultan who granted him an army, which allowed him to take over his Empire, taking Kabul, Kandahar, Peshawar, Lahore and Delhi. The whole pacification of the Empire lasted until 1555, the year when all the regions were subdued and Delhi resumed. Humayun died in 1556 of an accident, leaving the throne to his son. His reign was largely made up of displacements, conquests, pacifications, so he did little in the artistic, religious or social fields. It should be noted, however, that if the "official" religion was Islam, it regulated only the daily life. Sharia was not enforced, and the majority of political decisions were not influenced by Islam. In addition, Humayun brought the use of Persian as the language of the Empire. Previously the language was the tchaghatai, an ancient Turkish language from his grandfather. It was the son of Humâyûn, Akbar, who succeeded. The latter reigned for nearly 50 years, from 1556 to 1605, and it was he who greatly enlarged the Empire, gave it all its strength. The Mughal territory extended over all the north of India, and towards the south it reached the Deccan. Instead of punishing the Rajput princes whose territories were forcibly incorporated into the Moghul territory after the conquests of Akbar, the sovereign proposed them to enter the administration of the territory, including military posts. This strange way of doing for the time assured the Emperor that they would be particularly faithful to him, and he could also watch them closely. The newcomers were often married to the daughters of the Mughal nobility, which further consolidated, on the one hand, the populations and the territories, and on the other hand the cohesion within the territory. The Emperor also made the taxes, which were too disparate at the time, uniform and imposed a currency. From a societal point of view the Akbar era was marked by a great tolerance towards different religious communities of India. It must be said that as the territory grew larger it was important for the Mughals to weld the peoples who lived there, and nothing like a great religious tolerance to be appreciated. Akbar added to his prestige by being the precursor of the builders of the Empire. It was he who initiated a certain number of architectural projects destined to assert his authority by the construction of large buildings. One of the first was the tomb of his father Humayun, who served as a model for the future Taj Mahal. At the death of Akbar in 1605 his son Jahângîr ascended the throne and remained in power until his death in 1627. The empire he inherited was strong, stable and rich, and Jahangir made some important political changes in the habits established by Akbar. Jahângîr also continued to build, but he is best known for his passion for painted books and manuscripts or for his meticulous observations of nature as for his will to build buildings. The military campaigns were not carried out by the emperor, but rather by his son Khurram, whom he judged to be particularly competent. Khurram is the youthful name of the future Shah Jahan. Prince Khurram was the favorite heir, but the fact that he imposed himself on the throne was not obvious. Until the beginning of the 1620s Jahangir's wife, Nur Jahan, promoted Khurram's brother as successor, and this one had a strong influence over the emperor. It was his brother who was destined to succeed his father, but it was without counting the military capabilities of Khurram that he was forced to create a court around him, gradually taking all the attributes of a prince heir. Thus when Jahangir died Khurram declared himself emperor on the basis of a title of nobility which his father had offered him as a reward for a successful military campaign: Shah Jahan, which means "King of the world." Shah Jahan ruled for 30 years. During all this time he put forward his heredity which he considered as semi-divine, which is why he decided to build imposing monuments to assert his power. Shah Jahan attempted to give an image of himself that was consistent with that of Solomon, an Ottoman king who lived a century before and believed he was a righteous king. Wanting to copy Solomon's attitude was undoubtedly a proof of egocentrism, but many historical sources testify that Shah Jahan had a human side that was far from the egocentricity that he could have glimpsed through these acts. Shah Jahan married in 1612 to Arjumand Banu Begum, a Persian princess who later became Mumtaz Mahal. This marriage took place after a military campaign which lasted five years. From this year onwards this wife, the third, was her daily companion. She even went so far as to follow him during his travels until 1631, the year of his death. Women have long played a major role in the policy of the Mughal empire. For example, Akbar often sought advice from his mother, who was somewhat the representative of a council of female wise men who had the power, by the emperor, to make or break relationships between couples. The wife of Jahangir, Nur Jahan, is a notable exception in so far as she was the manager of her husband, whose health was declining, due to his age. Throughout his life Mumtaz Mahal gave birth to 14 children, of whom only half survived. She died shortly after the birth of her last child, too weak. The emperor made the coup, he had no contact with the exterior for two weeks, and was in mourning for two years. The queen was temporarily buried in the Burhanpur garden, the town of Deccan where she had died. Six months later, his body was transferred to Agra waiting to have his mausoleum the famous Taj Mahal. Shah Jahan survived his wife until 1666, but the last eight years of his reign were marked by his imprisonment, ordered by his son, in 1658. This son, Aurangzeb, had his father seized and locked him up at Fort d'Agra, overlooking the Taj Mahal. At his death he had him buried near his companion without much ceremony. 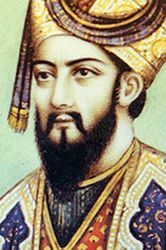 The son of Shah Jahan whom he imprisoned at the end of his life, Aurangzeb made decisions contrary to his predecessors. In his first year of reign he put forward his faith and ordered Islam to be the only religion of the Empire. The major problem was not only that his people were of diverse religions but also that he used to have a great freedom of practice. The imposition of Islam was very badly perceived, especially as he had the Hindu temples destroyed. Obviously, his reign was marked by numerous revolts that he mata one after the other. But Aurangzeb was also a conquering warrior, he further enlarged his territory, but perpetual war ended by rendering his Empire fragile. He died in 1707, leaving power to his son. The reign of Aurangzeb was also marked by a loss of landmarks. The import of Islam into all strata of society made the new equilibrium fragile. From an artistic point of view the musicians were banned, as were the dancers and all those who had to do with the art of distraction, the sovereign thinking it was contrary to Islam. He restored to the taste of the day the djizia, a tax to be paid by the non-Muslim men of the kingdom. This tax had been abolished by all its predecessors, beginning with Bâbur himself. Proof of the decline of the Empire, he built a mausoleum equivalent to the Taj Mahal for his wife, but this monument is clearly a failure when compared, one having a quality of execution far superior to the other. The plans themselves are totally different, that of Aurangzeb being ill-established. The Mughal Empire then began its decline, with subsequent emperors becoming weaker. The so-called "Mughal emperors" are the dynastic succession of the various sovereigns who have followed the first six. The difference with them was that the first emperors built the Empire, the followers only lost more and more authority and power over the territories they dominated. With them passed the golden age of Mughal culture, which eventually died out in the nineteenth century. Bahadur Shah is the first of the emperors who is not considered "great." Of a weak and gentle character, he was unable to preserve the whole of his Empire. The main culprit, however, was not the sovereign himself, but rather his predecessor, his father, who had provoked numerous revolts throughout the Empire by banning the practice of religions other than Islam. It was the Sikhs who were the farthest at the point of revolt. Their leader, Guru Gobind Singh, was quickly killed but just as quickly replaced by another Sikhs, Banda Bahadur, who managed to secede. Thus the Mughal Empire lost the Punjab, a region of northern India. On his death, after 5 years of reign (in 1712), his children went to war for his succession, as indeed Bahádur Shah himself. He was buried in Delhi. On the death of Bahadur Shah began a new war of succession between his four sons. 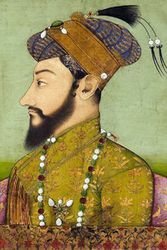 After several months of conflict Jahander Shah acceded to the Mughal throne, with the help of Zulfiqar Khan, an influential personality of the court. The latter took the ascendancy over the sovereign and began to effectively direct the Empire with the complicity of the Empress, Lal Kanwar. They both ravaged the treasure and led the Empire towards its fall, making questionable decisions. Meanwhile, Jahandar Shah was distancing himself from power, unable to keep his role. As a result, civil war broke out again, led by a nephew of the emperor, Muhammad Farrukhsiar. The latter raised an army and attacked the troops of Jahandar Shah, the battle took place on 6 January 1713 in Samugarh. He won and the emperor was obliged to flee with his wife. He will be betrayed by Zulfiqar Khan, who thus gained the confidence of the new emperor. 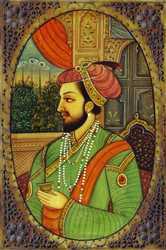 Jahandar Shah was thrown into prison, there he died assassinated on February 11, 1713. Farrukhsiar was the nephew of Jahangar Shah, grandson of Bahadur Shah. He took power in 1713 and ruled the Mughal empire until his death in 1719. He was assassinated by the Sayyid brothers, who nevertheless were close to him. The brothers placed their cousin Rafiud-Darajat on the throne. Then began a great period of trouble during which the Empire was left to the abandonment by monarchs more eager to assert their legitimacy than to strengthen their territories. Rafîud-Darajat took power over the Mughal Empire in 1719. He was replaced by Rafî ud-Daulat, his brother, during the war of succession that raged that year. Like his predecessor and brother, Rafî ud-Daulat did not even remain a year on the throne, he was replaced by Nekusiyar during this fratricidal war. Nekusiyar remained on the Mughal throne only a short time, and was replaced by Muhammad Ibraham, also in 1719, his brother. Another son of Jahandar Shah, he participated in the war of succession created between brother. He took power in 1719 and retained power one year, beaten by Muhammad Shah in 1720. Muhammad Shah acquired the title of emperor by force, following his victory over Muhammad Ibrahim in 1720. He recovered a tattered Empire, made of regions that had taken their autonomies in fact faced with the inaction of his predecessors. It was the victim of the attack of the Persian emperor Nader Shah in February 1719, which entered without difficulty in India. Great revolts took place but Nader Shah repressed them by killing 30,000 people. Muhammad Shah had to cede his treasure, including the famous Throne of the Peacock, to the Persians to leave the Mughal territories. Muhammad Shah pursued the management of his Empire with little force until his death in 1748. It was his son who succeeded him, son of Bagum Qudsia. The son of the Emperor, Ahmad Shah Bahadur ascended the throne in 1748. He was less inclined to rule a vast empire, brooded by an ubiquitous mother, and had all the more difficulty in assuring his role that he had received nothing education on this subject. He reigned without stature until 1756 before being dismissed, blinded and imprisoned. He died in 1775, when power had been transferred to his brother. 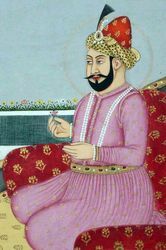 A brother of the previous ruler, Aziz ud-Din Alamgir becomes a Mughal emperor following his dismissal. He is supported by people more influential than him. It must be said that he spent most of his time in prison, in order to be sure that he was removed from the throne. He takes the reins of the Empire at the age of 55, without any experience, which means that in practice it is his Wazir, Ghazi-ud-Din Imad-ul-Mulk, who runs the territory. 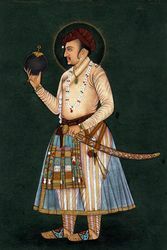 His reign was characterized by the attack of Ahmad Shah Abdali in 1756, which invaded Delhi and gave more power to the Marathes, a people formerly subjected to the Mughals in the northern Empire. Almgir was assassinated in 1759, his son succeeding him. Shah Jahan II took power in 1759 at the death of his father. His reign, very short, is best known for the battle of Delhi lost to the Marathas. He is quickly dismissed. Of great longevity, the reign of Shah Alam II is that of the inexorable fall of the Mughal empire. Influenced by the Marathes of North India, he suffered a major defeat at the battle of Buxar in 1764, a battle sealing the fate of Bengal, which was definitively lost to the Empire. In 1788 he was dismissed by a vassal, Ghulam Qadir, but he was soon able to resume his throne. In 1803, the English, established like most European peoples in Indian factories, fought a battle in Delhi. The city was conquered by the English, and Shah Allam II was no more than a puppet sovereign in the hands of Europeans. It was during his reign that the Mogul army was dismantled. He died in 1806, his son succeeded him. Muhammad Akbar Shah received the Mughal throne in 1806, at the death of his father. He had absolutely no influence over his Empire, which was in fact in the hands of the English. He tried to strengthen his power by sending Ram Mohan Roy to England as an ambassador, but he did not succeed in gaining any influence whatsoever. Muhammad Akbar Shah was a monarch of principle, he had but one title, but in no way represents the Mughal Empire, which arrived at its final end. The son of the former emperor, he had, like his predecessors, only the title of Mughal Emperor. It is under the control of the British Empire, on which it depends entirely. When he came to power in 1837 at the age of 62, he was carried against his will at the head of the Insurrection des Cipayes in 1857, an insurrection that aborted. He was then arrested by the English, his children murdered, and he was exiled to Myanmar in Rangoon, where he died. Muhammad Bahadur Shah was the last of the Mughal emperors, an empire that covered much of India for nearly 300 years. The Mughal dynasty, which ruled over northern India before conquering a territory ranging from Afghanistan to Bangladesh and the Himalayan chain south of the Deccan, was the governors of a strong empire, many components in its populations. Such diversity is reflected in the art which is characterized in them by a double Islamic and Hindu influence. The heritage of Mughal art is represented mainly by monumental architecture, painting and especially the art of miniature, decoration, calligraphy and jewelery, but also by textile, and especially floor mats . Above all, it must be known that Mughal art is not the product of a single person, or of a group of people, but rather a more general stream that has been oriented according to the sovereigns in one direction or another. It was they who generally protected artists and financed their work. In the Mughals, art is therefore rather connected with nature. No wonder floral and animal motifs are found on the Taj Mahal, built between 1637 and 1654, in the golden age of this civilization. These motifs are mainly on the walls of the building, on panels of white marble surrounded by friezes with geometric patterns. Sometimes they are red sandstone panels, but in any case the artists of the time used 3 different techniques to work: the pietra dura, the stone relief and the marble lace. The result of these decorations is accompanied by calligraphy from the Koran. The colors that we see on artistic work come from the use of precise and semi-precise stones such as agate, amethyst, crystal, jade, lapis lazuli, topaz, turquoise, sapphire, and the like. which are incorporated into the marble. To better understand the history of the Mughals, it is necessary to have a biography of each of the first 6 emperors, it is they who conquered the Empire and radiated throughout the South of Asia for two centuries. 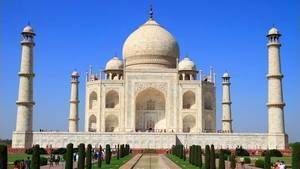 These biographies are available here, with the addition of Mumtaz Mahal, the dead wife in custody for whom the monument was built. History of the Taj Mahal.